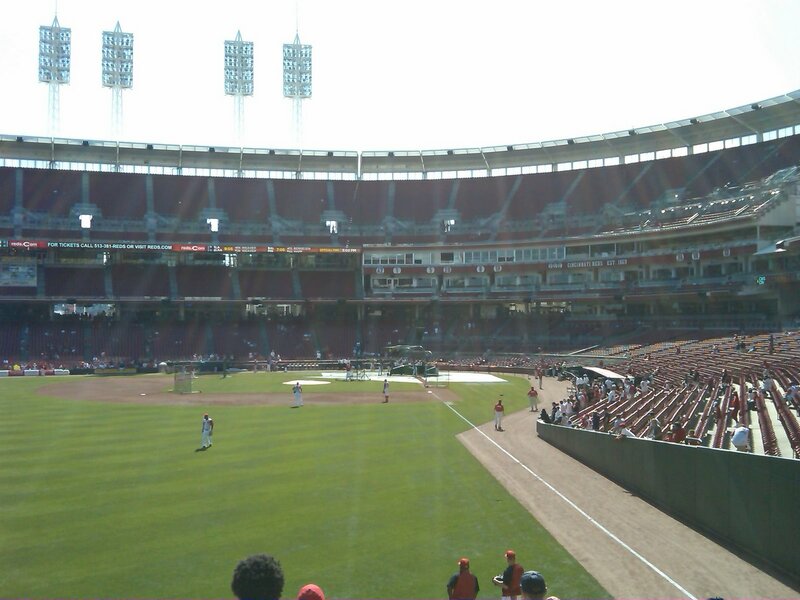 When I was going to Cincinnati I kept wondering how cocky the team was to name their park the Great American Ballpark. They are saying that the park is great? 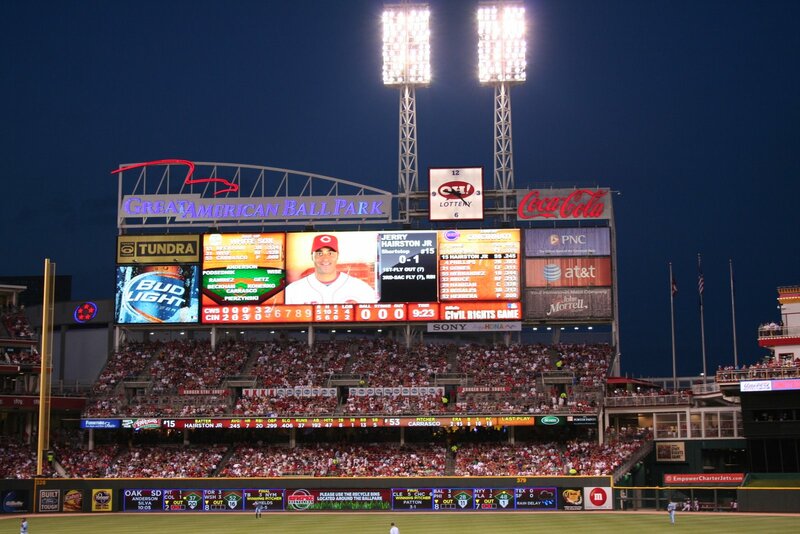 I later found out that the park is named such because the naming rights were bought out by the Great American Insurance Company which is located in Cincinnati. They have the naming rights for 30 years. Once I left the park at the end of the night I would have agreed with my original thought. 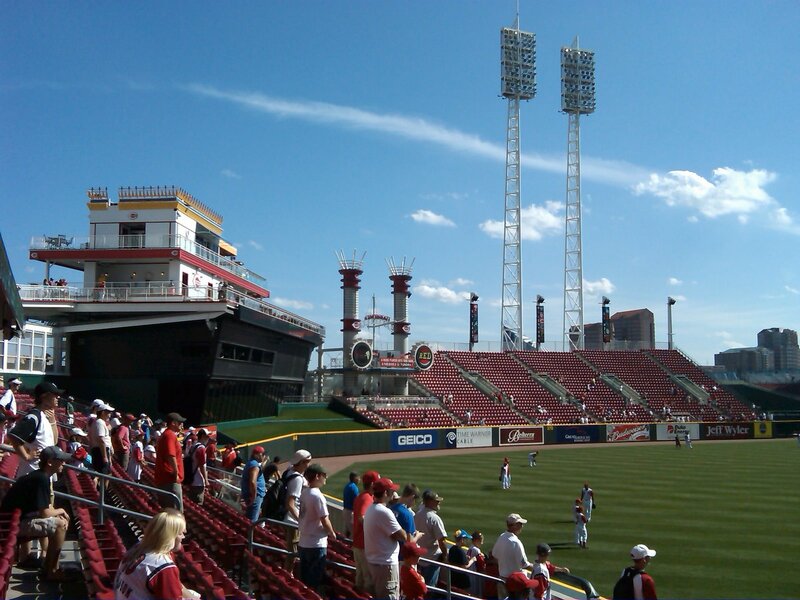 This is a Great American Ballpark. It has many things that make it so. I will highlight a few of those in the next few paragraphs. 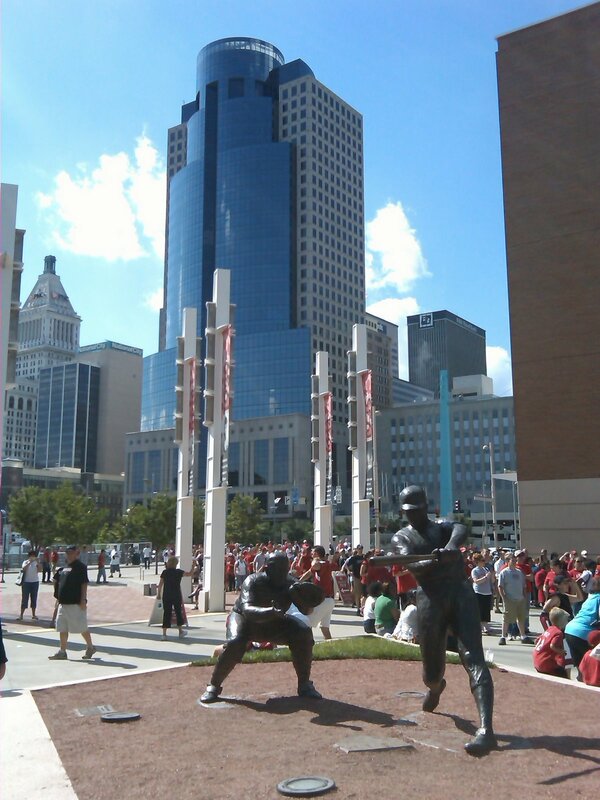 The first p art of the park that I will highlight is the Crosley Terrace. This is located just in front of the main entrance. 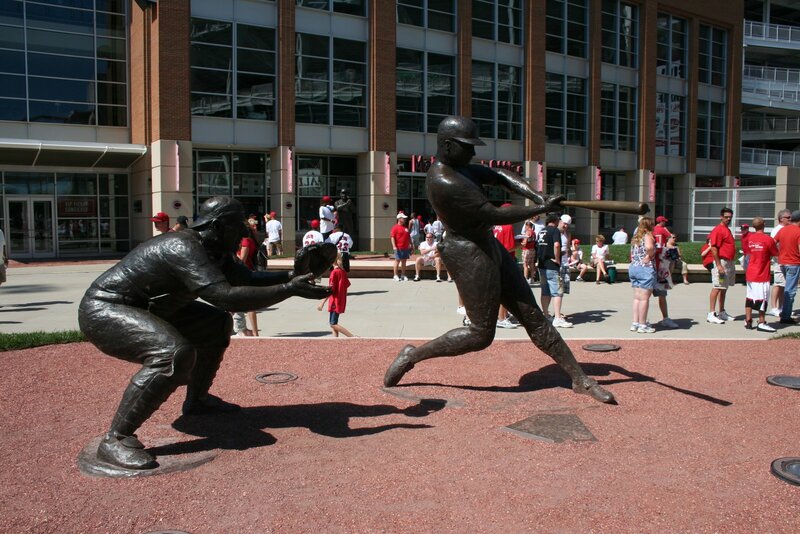 The have placed statues of Frank Robinson, Ted Kluszewski, Joe Nuxhall, and Ernie Lombardi in a game type situation. They are on a mock diamond playing a pick up game of baseball. Nuxhall is pitching to Robinson with Lombardi catching and Big Klu on deck. In the picture on the left you can see Frank and Ernie with the city of Cincinnati in the background. 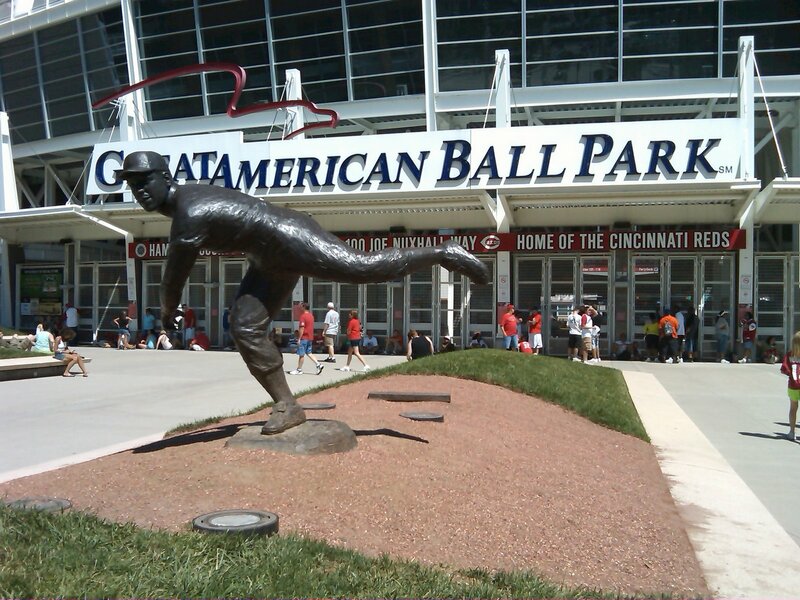 Joe Nuxhall is positioned right in front of the main entrance. The picture of this can be found to the right. This is a great first view of the park, and it gives a nod to the stars of Crosley Field. Right away you get the feeling of some of the history of this ball club. You can enter the park at a few places, but if this is your firs t trip here, you want to enter here. You will probably want to check out the Reds Hall of Fame and Museum anyway. The Hall of Fame is located next to this, and is another great feature of the park. I have already done a write up on that here. It is worth a visit so plan some time before the game to walk through the museum. 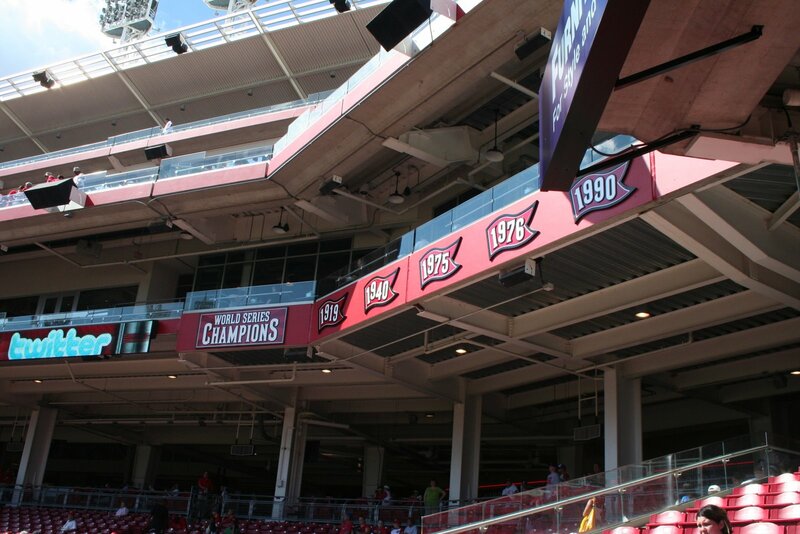 All around the outside of the stadium are banners showing great moments in Reds history. The one pictured to the left is showing the night Pete Rose passed Ty Cobb to become the all time leader in hits. These banners guide you around the stadium, and show you how rich in history this club really is. It makes for good reading, but don’t read to much and run into the next one. The stadium also has two murals located just to the left once you walk through the main entrance. The first of the murals shows the original Reds team with the Wright brothers front and center. 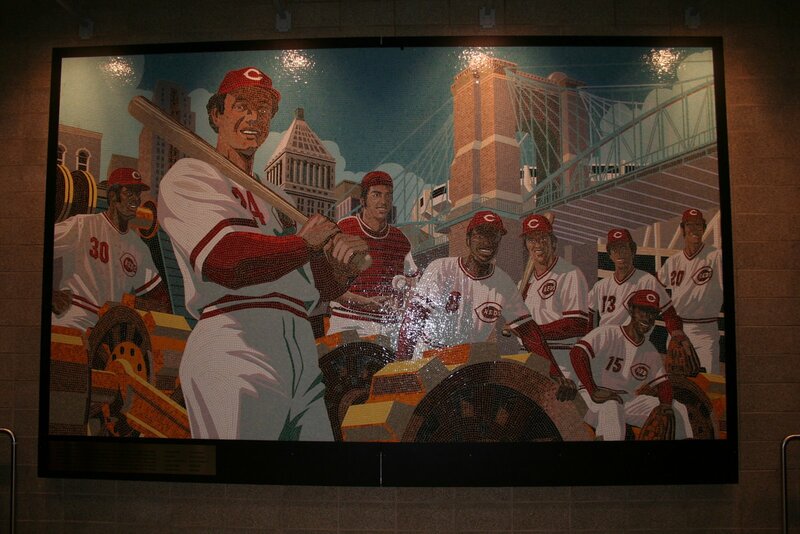 The other mural pictures the Big Red Machine in all of thier glory. That mural is shown to the right. Another point of interest when you visit the stadium is the Machine Room. This is a small bar located in left field. They have tons of memoribilia from the Big Red Machine days. If you are into this kind of thing you will enjoy it. The stadiu m has three decks from foul pole to foul pole with two decks in left field. A small gap exists in the upper decks between home plate and third base. This gap was left on purpose so that the people working in the high rises in downtown Cincinnati can see into the park. The view that you get from the third deck is tremendous. You can see the Ohio River beyond the outfield. It is this view that is shown in the panorama at the top of the post. This stadium was really designed wonderfully. At th e end of the upper deck near the left field foul pole they have the banners showing all of the World Championships on the base of the second deck. In the picture on the left you can barely see the retired numbers that are located on the press box. They have also retired the microphones of three past Reds broadcasters. Those are located in the center. As per usual I will give way too much info about the scoreboard. This one is massive. It towers over all of the left field bleachers. This scoreboard is massive. It is 138 feet wide and 38 feet high. The clock at the top of the scoreboard is a replica of the old clock at Crosley field. As you can see by the picture the pregame scoreboard gives you the video board in the middle with both lineups on each sides of that. The high def LED screen is used to show replays and other video in game. One thing that they do not do though is to show replays of questionable calls. I guess they don’t want the fans to get too excited. As you can see by the picture during the inning you get the batting order of the team up, and the defensive positions of the team in the field along with the next three up the next half inning. You also can see the mug shot of the player at bat with his season and current game stats. I talk about how some teams make it hard to keep score sometimes on this blog. Here in Cincy they make it easy. They will actually show you the curr ent batters scorecard later in the game. Check it with yours to see if their is a discrepancy. 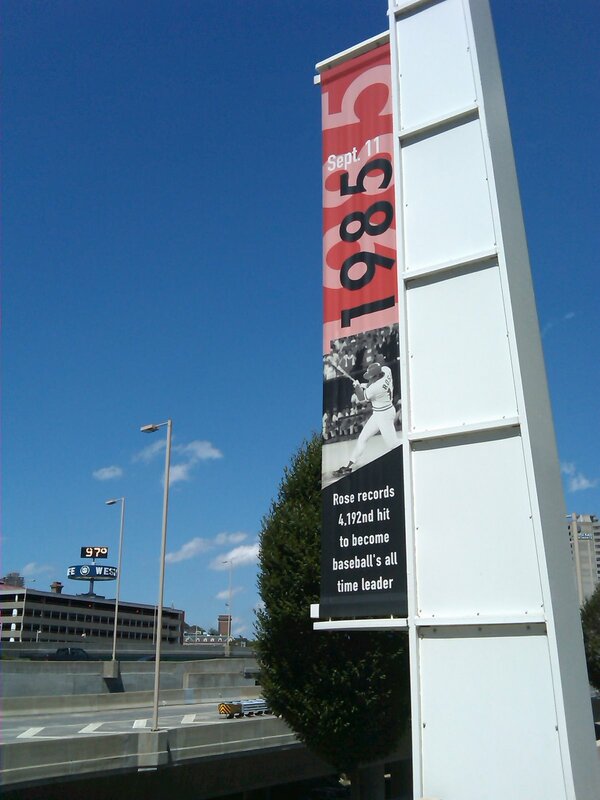 On the back of the main scoreboard is a mural named “4192.” It shows Pete Roses’ bat and a ball on the field of old Riverfront Stadium. A picture of this mural is shown on the right. On the left field wall below the scoreboard is an out of town scoreboard. This board gives more than just scores of the games. You basically get the MLB.com gameday for each one. You can see the score, current pitcher, current batter, outs, inning, and a diamond with any baserunners shown on the appropriate base. In the picture you can also see the light towers that have been dubbed the toothbrushes. 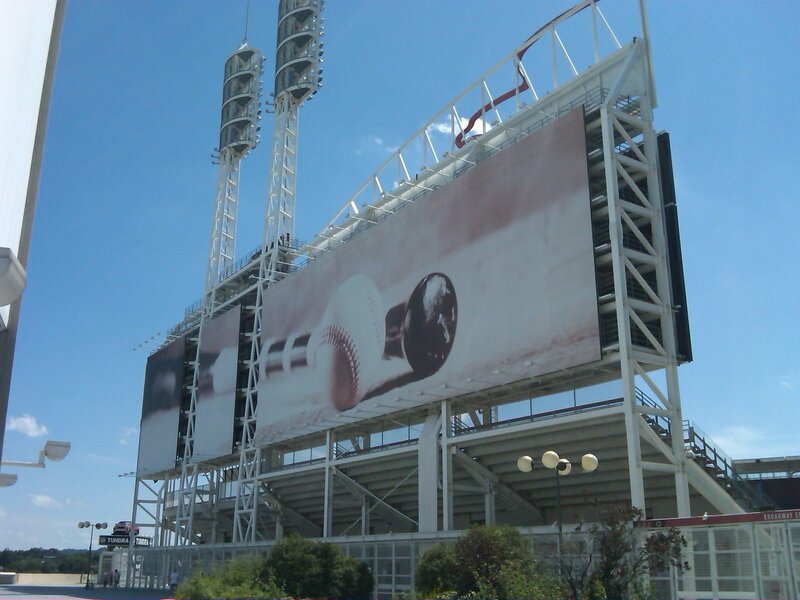 I have never been to Jacob’s Field in Cleveland, but I have been told that they have the same light towers. It must be an Ohio thing. They are different, and give the stadium a unique look. 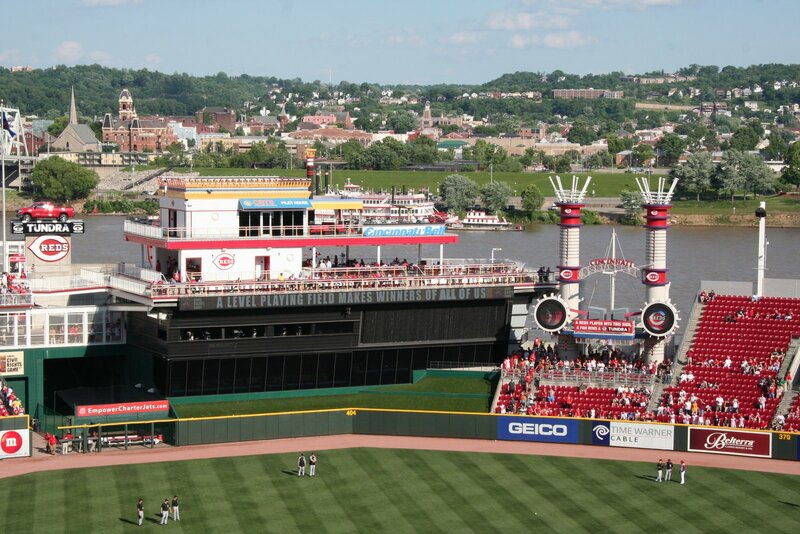 Two other gr eat features of the outfield are the smokestacks and the riverboat deck. The smokestacks. 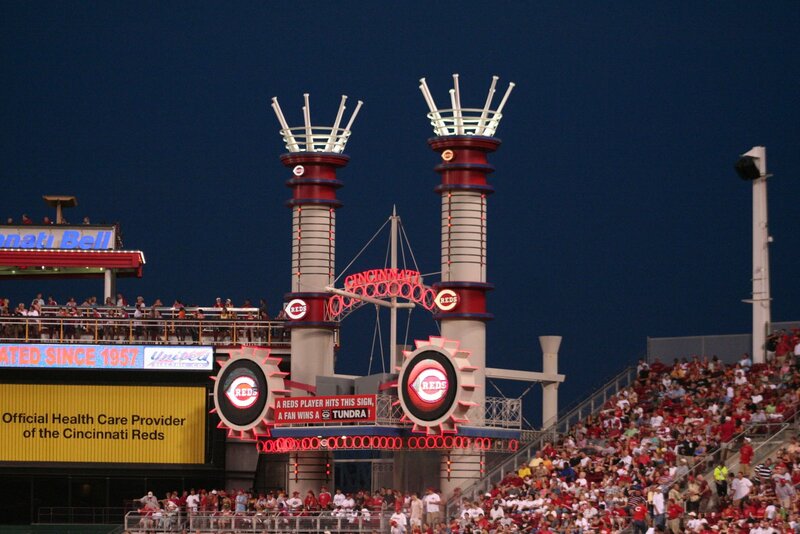 The stacks are 64 feet high and 34 feet wide, and stand inbetween the riverboat deck and the right field stands. When a Reds player hits a home run fireworks erupt out of the stacks, and they light up. As a person who is still a ten year old inside I always want to see these things in person. This is not as famous as the apple was in New York, but is still really cool. The stacks look even better at night when they are illuminated. Two small paddle wheels are located at the base of each stack. 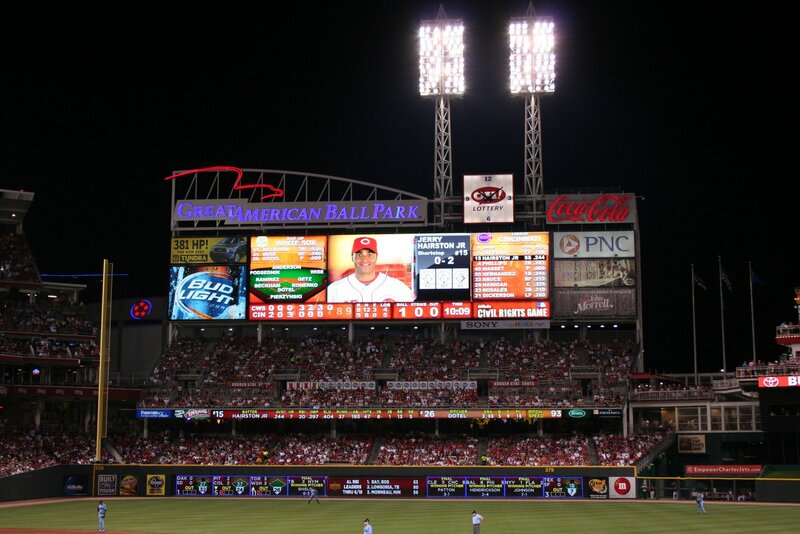 They have small video boards that display Reds logos throughout the game. The riverboat deck is a fairly new feature to the stadium. It is a party area in straight away center field that can accomidate around 150 fans. This two story feature is for private parties, but gives a great view of the park from its upper deck. These two features along with the scoreboard really give the outfield a great look. This entry was posted in Cincinnati Reds, Major League Baseball, Stadium Guide. Bookmark the permalink.